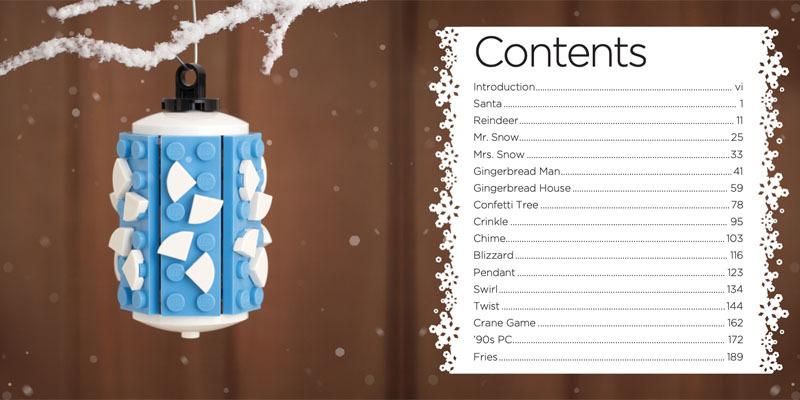 Want to show your commitment to LEGO bricks, while also decorating your place with some seasonal cheer? Why not some Christmas ornaments to spice up your tree (and anywhere else)? 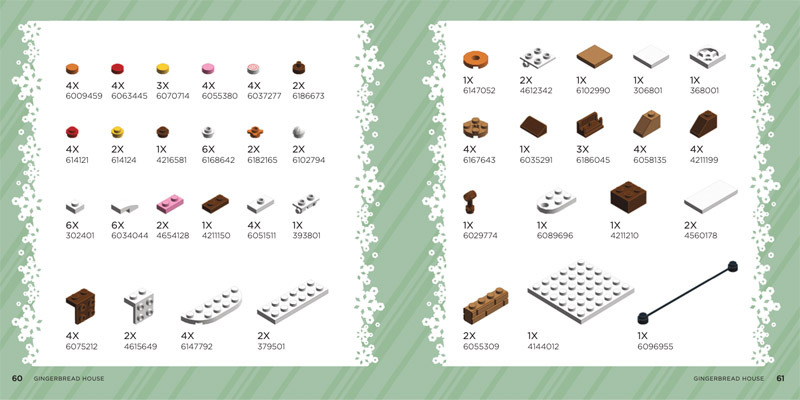 In The LEGO Christmas Ornament Book Volume 2 by Chris McVeigh, you will find a great starting point. Let’s check this seasonal book out. Christmas is right around the corner! It’s an exciting time for LEGO fans. Whether it’s themed Advent Calendars or seasonal sets, and, of course, giving and receiving LEGO as gifts, there’s something for everyone. But what about using these versatile little bricks as decoration? 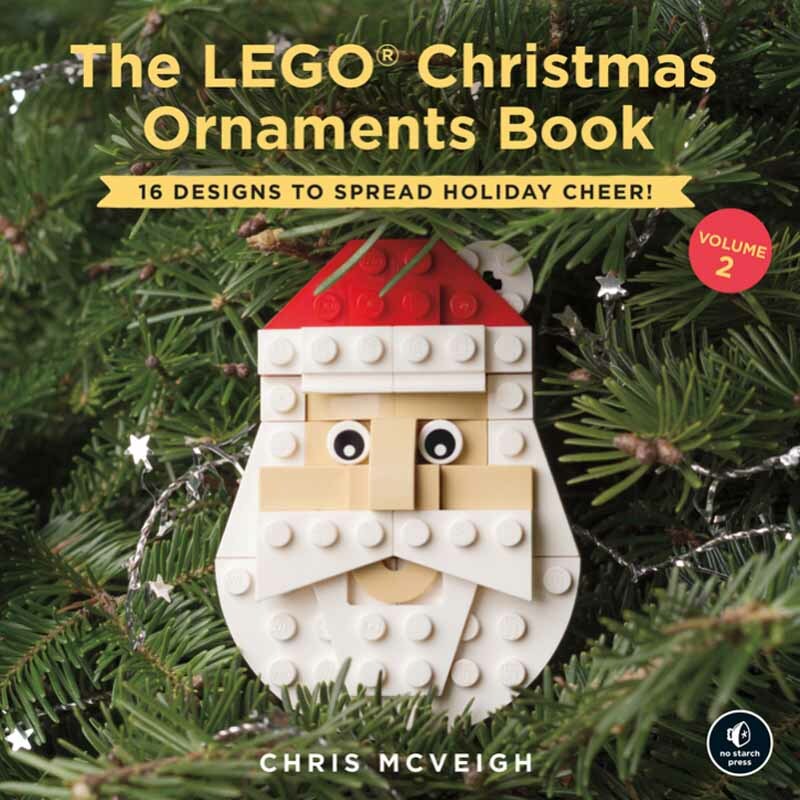 Enter The LEGO Christmas Ornament Book Volume 2 by Chris McVeigh. With no extra text or clutter, this book offers 16 unique Christmas decoration designs you can easily build from your own collection. Simple, and effective! Published by No Starch Press, this book comes in both print and digital formats. We at Brick Pals reviewed the digital version (included in the print version as well via No Starch). This book has no text beyond a brief introduction. Instead, it focuses on the meat of the matter: LEGO building! Each of the sixteen creations come with a detailed visual step-by-step guide. Before each project, the author lists all the LEGO pieces needed, with their numbers. This makes it easier for collectors to identify and even acquire missing pieces if necessary. A great place to source parts is Bricklink. The book index shows all different sorts of decorations you’ll build. There’s a wide range of subjects to choose from. Santa, Reindeer and Snowman all make appearances. Some of the builds are very traditional, such as baubles, swirls and other abstract, colourful shapes. A 90’s PC, on the other hand, offers a more geeky option. Of course, as with every LEGO creation, the book opens up a world of possibilities. While the content may seem straightforward and sometimes quite simplistic (while still cute), it’s a perfect starting point for more adventurous creators to build upon. The variety of builds help as well: why not decorate a tree with entirely food-themed ornaments such as the fries, the gingerbread man and the gingerbread house? Or why not take it in the other direction using the PC and Crane Game as starting points for a more technological approach? While the book doesn’t quite offer enough options for such bold notions, there’s definitely a starting point for ideas. The builds also follow different styles of building, from simpler plate designs to more three-dimensional version creations. This, of course, offers even more variety. As mentioned, the book offers a complete list of all pieces you’ll need for a particular project. While some may require more specialized parts, the majority of them draw from simpler parts easily found in anyone’s collection. The book also shows the colours for the final product, but any builder can, of course, swap them for whatever colours they do have. It also shows the number of pieces of each colour, type and size you’ll need, making it fairly easy for builders to separate the materials they’ll need. The book shows all pieces, in which colours, with the number of pieces you’ll need. 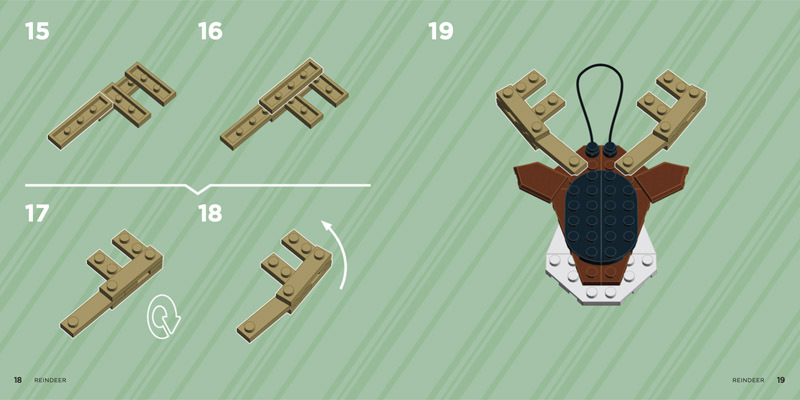 As with any inspiration LEGO book, the instructions are guidelines; you don’t need to follow them exactly! On the other hand, inexperienced builders will benefit from the techniques shown. The projects are shown in a step-by-step basis, with the piece positions and build sequence clearly laid out. Smaller builds are also shown in their own, separate steps, making everything very clear and easy to follow. As mentioned before, the book comes in both digital and physical formats, at the buyer’s discretion. The digital version comes in a variety of standard formats such as PDF, ePub and MOBI, easily readable by all eBook readers and both PCs and Macs. Amazon also offer the Kindle version, as well as the popular hardcover. There are detailed instructions for smaller builds inside a larger build as well. All instructions come in full colour and high-quality illustrations and photographies, giving an accurate outlook of the final product. Beyond the thoroughness and creativity, they’re colourful and aesthetically pleasing as well, making it a delightful experience for pre-Christmas cheer. This fun little book is an excellent opportunity to begin on the Christmas ornament spirit. While it doesn’t have a lot of projects, showing only sixteen, the variety and attractiveness of the builds are enough to inspire and stimulate builders young and old into adding a little LEGO goodness to their holiday decorations. The colourful, clear instructions and amazing final products offer a great starting point into further imaginative projects using the techniques shown and the pieces one has available to build with.